Having an RV gives you the option to travel around the country and enjoy the various cultures and beautiful landscapes of the nation. But for many RV owners, the journey is crippled by the daunting task of finding a reasonable power source. At Colorado Standby we offer a wide selection of RV propane generators that can be a great addition to your RV by providing you with the power you need for your travels with an Onan propane generator. While fifth wheels and class A vehicles may come with a portable power source, it is not always the best one for your needs. Other travel trailers may not even come with a portable power source at all. RV generators provide the best option for getting power to your RV. You need that power for appliances, lights, and climate control. At Colorado Standby, we supply our customers with generators from Cummins Onan who have been creating generators since 1920. We have a wide selection of propane generators for RVs with multiple features, including gasoline, and Onan RV diesel generators to choose from. There are many considerations to evaluate when picking an Onan RV generator. What kinds of features and amenities will your generator need to run? Are you looking for something portable or permanent? Is the weight of the generator something you need to be conscious of? Are you concerned with emissions? Does your RV run on gas or diesel? If you don't know the answers to all of those questions, Colorado Standby can help. We understand the selection process can be intimidating and that is why we offer our expertise from nearly 20 years in the field. We can help you determine the size you need based on the electronics you have, decide whether you need diesel or propane generators for your RV, and select the models that are right for your budget. Our knowledgeable staff, free shipping, and wide selection of in-stock items make us the best place to meet your RV generator needs. 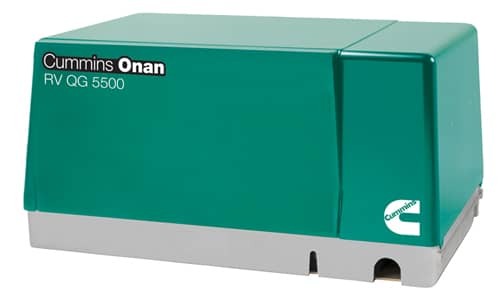 The biggest advantage of Cummins Onan generators is that they provide quiet, reliable power. When living or staying in your RV, your quality of life could be disrupted by a loud power source. The enclosed mufflers and low vibration levels on Cummins Onan propane RV generators mean they won't interrupt your daily life. Of course different generators offer different advantages.RV Diesel generators are the quietest but are harder to find, gas generators are usually more affordable and more portable, and the Cummins Onan propane generators are going to produce the least emissions and have the longest shelf life. If you need to choose a generator for your RV or travel trailer, let us help you make the best decision for your vehicle and lifestyle.